Celebrate the beauty and miracle of pregnancy with a Mama-to-Be pendant. The pendant was designed to represent a gorgeous pregnant belly with a smaller pea to represent a boy or girl baby. Perfect for a gender reveal or just to celebrate the miracle of new life! Choose your color! 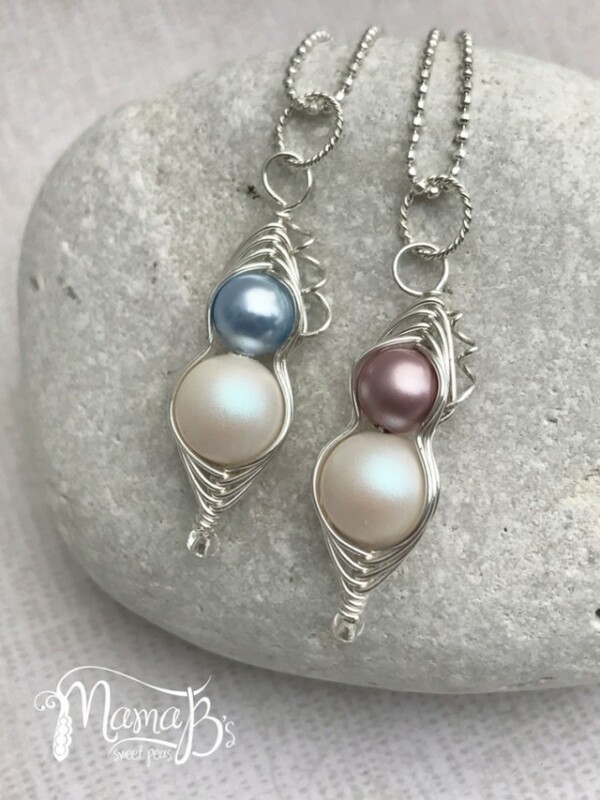 Handmade and personalized to order with: - Genuine Sterling Silver wire - 6mm & 10mm Swarovski Crystal Pearls All of Mama B's Sweet Pea products are made with beautiful Swarovski Crystal Pearls. Unlike synthetic glass pearls, these pearls have a leaded crystal core that gives them a heavier feel and allows them to warm to your skin like natural pearls. The specialized coating gives them an exquisite sheen and luster with great durability, including resistance to perspiration, UV rays, perfumes and scratches. Great care has been given to choose components of the highest quality to create your Sweet Peas. I absolutely love these pearls, and I'm sure you will too!